Everyday there is a war being waged on America's inner city streets--a war between residents, drug dealers and the people sworn to protect one from the other. This war has its casualties, none greater than L.A.P.D. Detective Sergeant Alonzo Harris, a 13-year veteran narcotics officer whose questionable methodology blurs the line between legality and corruption. His optimism has long since been chipped away by his tour of duty in the streets, where fighting crime by the book can get you killed and getting the job done often requires Alonzo and his colleagues to break the laws they are empowered to enforce. This crime tale shadows Alonzo as he tests the resolve of wide-eyed, idealistic rookie Jake Hoyt, who has one day and one day only to prove himself to his fiercely charismatic superior. Over the next 24-hours, Jake will be pulled deeper and deeper into the ethical mire of Alonzo's logic as both men put their lives and careers on the line to serve their conflicting notions of justice. 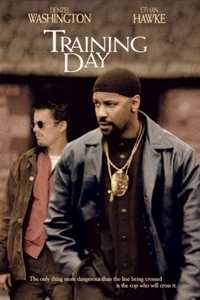 A veteran narcotics officer whose ethics are dubious at best and sadistic at worst, rudely awakens his new rookie partner from his idealistic dreams. If all first days on the job were like this, unemployment rates would be sky-high.